Artists Comments: The very next day after I painting the most terrible painting of my life, I decided I immediately needed to redeem myself and headed to the ocean to paint what truly inspires me. Sandy beaches, swaying palm tress and a mesmorizing ocean with shades of colors that continue to inspire my imagination. My challenge with this painting was to accurately represent the lava fingers flowing from the land into the sea. Here the ocean is wonderfully clear allowing you to trace the lava as it creates amazing shapes and shadows as it transcends thru patches of sand toward the depths of the sea. 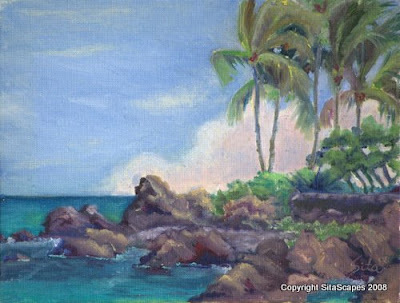 I further experimented with creating a presence of clouds which were not present that day to add interest to the horizon and give a contrast element for the palm trees. I am particularily satisfied with my efforts on this painting.